Now, in the scope of your worst day ever… is that dent maybe a bigger deal? That shift in perspective shows you exactly how The Law of Contrast works. When is $300 Less Than $300? The Law of Contrast explains how we react when we’re presented with two different choices or alternatives at the same time. Contrasting two or more different choices can distort our perception of both options, as you saw in the example earlier in this article. For the most part, if the second option is very different from the first, we tend to see both options even more differently than they actually are. See, the human brain needs a benchmark or a comparison to make judgments, especially in unfamiliar situations. Our brains need to make comparisons with our past experiences because they crave contrast. So when you provide your customers with contrast, you are creating those comparisons for them. In fact, one of the cornerstones of our Total Immersion Program is the fact that we give customers 6 options on every job. We do this to take advantage of the power of the Law of Contrast. 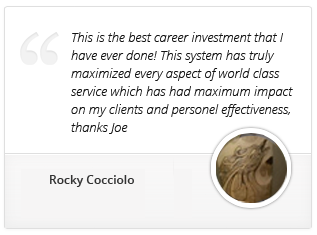 We teach our students to give each customer two premium options, two mid-range options, and two economy options. 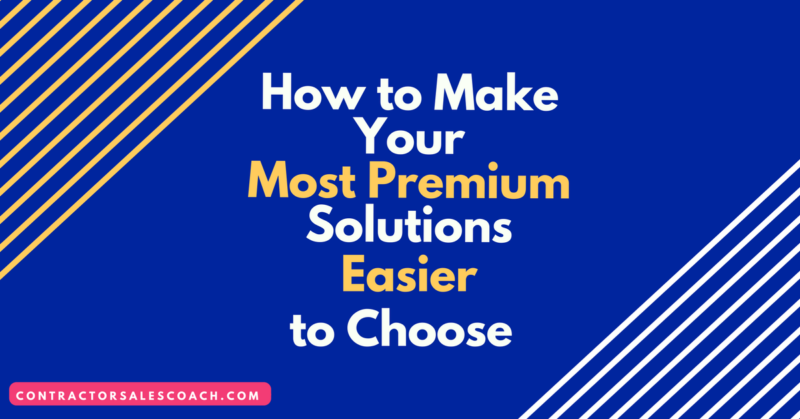 The more premium options create contrast, raising the perceived value of all of the options, and making the lower and mid-range options appear more reasonable and affordable. The most important part of the Law of Contrast is that it gives you the ability to shift the focus of the customer. By providing a couple more permanent solutions that have higher prices, you’re focusing the customer’s mind on a higher value. Because when you offer something with a higher cost first, things that are less costly than the higher item will be viewed as even more reasonable. We teach our Total Immersion students to create their top (first) option to get a “no” from their customer. It should be a very high-end, high-investment option. Almost unreasonable so. Why do we teach that? Because when faced with a high, almost unreasonable price, the human brain begins to search for a more reasonable offer. At the same time, upon seeing an expensive solution, we incrementally raise our expectations of all solutions. When we present our high-investment premium solution first, followed by very good but more affordable mid-range and economy solutions, the customer sees the value in those options and perceives them as much more reasonably priced. While most contractors are still throwing one price ultimatums at customers, our Total Immersion students have been showing each customer 6 options. The result? Nationwide, over 74% of our client’s customers are choosing in the middle. That represents a significant upward shift in sales and revenue… and it’s all because of the Law of Contrast. If you’re in a leadership position in your company and you want to learn how to have your whole team selling more and creating more profit than ever before (including how to use the Law of Contrast) you should take a serious look at our industry-leading Total Immersion Program. Total Immersion will teach you and your team how to get customer buy-in throughout the service and sales process, making the buying experience more enjoyable for them and more profitable for you! Click here to learn more and see when our next summit begins.